Defined by its toughness and stylish unique look, this mens wedding band is made of scratch-resistant tungsten carbide with 7 genuine natural white diamonds that are channel-set in a stainless steel center band. 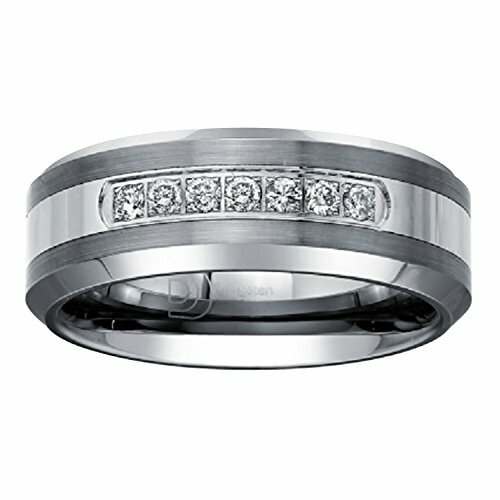 The beveled tungsten edges make for a real comfort fit while the contrasting stainless steel illuminates the diamonds. Wear it as either a mens wedding band or mens fashion ring. ** Please note that the ring's center is stainless steel and the outer band is tungsten. Stainless steel is not as resistant to scratches as tungsten so be prepared to notice some wear over time. While both tungsten and stainless steel are hard wearing, take good care of your ring. Tungsten can be damaged if struck at high force at certain angles. If you have any questions about this product by AX Jewelry, contact us by completing and submitting the form below. If you are looking for a specif part number, please include it with your message.